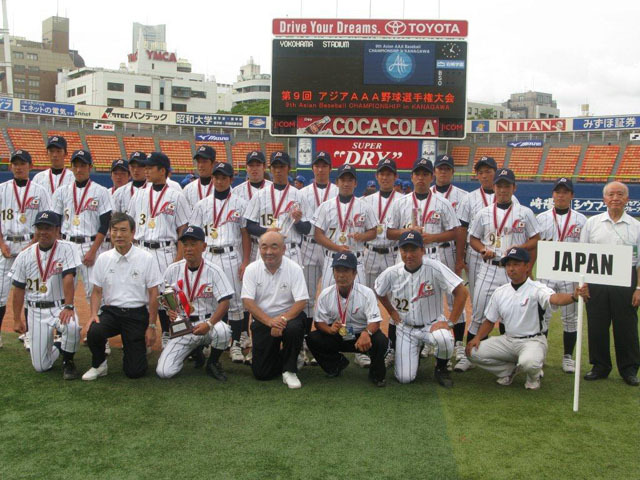 Yokohama Stadium: Japan defeated former Asian Champion Korea 6-1 and won the title at the 9th BFA 18U BASEBALL CHAMPIONSHIP for the first time since its 5th tournament in 2005. Pitcher Kentaro Yoshinaga, working with fast ball and sinking breaking ball, went the full distance giving only one hit to Korea. Japan’s first run was scored by Takahashi who hit two run homer over the right field fence in 3rd inning. Japan added 2 runs each in 4th and 7th to support pitcher Yoshinaga. Korea employed the same pitching staff as against Chinese Taipei yesterday with Byon Jin Su as starting pitcher then Ham Hyun Hee. Defensive errors did not help them either. Gold-Japan, Silver-Korea, Bronze-Chinese Taipei, 4. Philippines, 5. Sri Lanka, 6. Thailand, 7. Hong Kong and 8. Pakistan. Yokosuka Stadium: 4 runs in 4th for Chinese Taipei included Yang Hong Shen’s run-scoring two base hit and additional 4 runs in 6th by 5 hits plus 2 runs sealed the game in 8th inning, winning Bronze Medal for Chinese Taipei. Li Kang Shen allowed Philippines 4 scattered hits over 7 scoreless innings and Lee Yen Chang blanked 8th inning. Munoz hold Korea scoreless for the first 2 innings but went down in 3rd and 4th by errors and offense was held scoreless by strong pitching of Chinese Taipei. Jadaruman, and an inside-the-park home run of Rashmika into right-center field brought a 5 run lead for Sri Lanka. Pitcher Maduranga hung on even though allowing Thailand a run in the bottom of 9th. Thailand scored first by three base hit of Turara in 3rd inning but could not keep the lead with Ku Aoyama gave late in the game. Yokosuka Stadium: Hong Kong scored 15 runs by 12 hits with 21 batters in 1st inning and continued to add runs helped by errors of Pakistan. Kwun Hei and 2 other pitchers held Pakistan no hitter. Although Pakistan whitewashed the tournament but scored a precious run against Hong Kong in 1st round. As August was fasting month of Ramadan which also prevented players from training, Pakistan did their best and pitcher Abudullah impressed many people with his almost lone battle throughout the tournament.